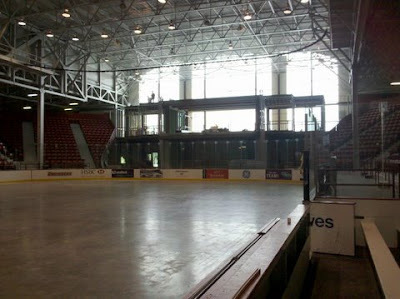 We're coming up on Labor Day weekend, and even though it may not feel like it outside just yet, we're just three weeks away from hockey at Houston Field House when the women take on the University of Montreal in an exhibition game at 4 p.m. on September 25th ahead of their trip to Wisconsin the following weekend. 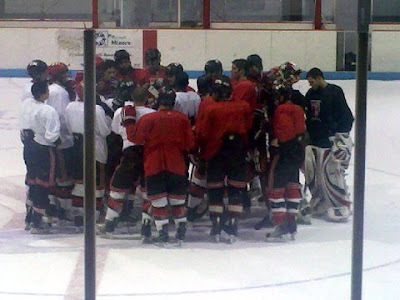 A week later, the men take part in the Cherry and White intrasquad scrimmage on October 2nd at 4 p.m., to be followed at 7 p.m. by an AHL preseason game between the Adirondack Phantoms and the Albany Devils. Three days after that, on Tuesday, October 5th 7 p.m., the men will face the University of New Brunswick in an exhibition matchup ahead of their trip to Colorado the following weekend. 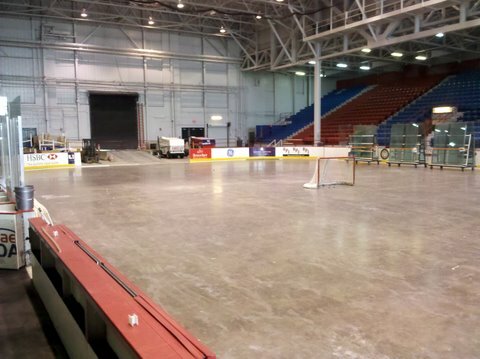 In the meantime, renovations continue apace at the Field House. We've got some pictures. This is the first picture we've seen of the new section with the lights on in the Field House. According to what we've found out about the project, the floor level will indeed contain some Let's Go Red space and a mini "Hall of Fame" type area. The second level will house men's hockey offices on one side, women's hockey offices on the other side, and in the middle will be a reception room for Dr. Jackson and her guests, high rollers, donors, recruits, etc. There are plans for a third level, which may include additional press space, but this will not be included as part of this project at present. The east side of the Field House is starting to look a little more familiar as the dashers have now been put up on that side, but it's still sans glass. There's still no stage - and there isn't going to be, apparently. 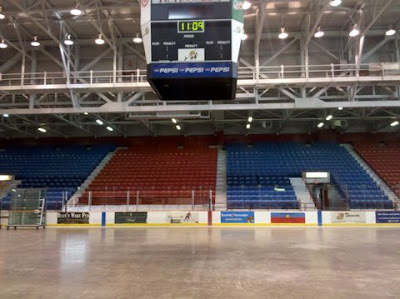 The current plan is to put the Pep Band at the top of Section 13 on the north side of the Field House instead of on stage, and the eastern curtain will be moved closer to the glass. The goal is to create a more "intimate" feeling within the Field House, but we'll see just how well it works in a month's time. There are a number of issues for the band especially, having to arrange themselves in the stands. The old scoreboard is right back up where it normally is. There's been some conflicting reports as to whether it is going to be replaced mid-season (along with the sound system) or whether the replacement will wait until the next offseason, but the components themselves should arrive before the end of the year. The mid-season replacement may be what's going to happen - according to the site manager, the building will have ice and be habitable for sporting events by the time scheduled events begin again in three weeks, but the renovations themselves will not be completed until December. With the Field House still lacking in ice, the captains have had to move their practices to Knickerbacker Arena in North Troy. Here's John Kennedy (center, no helmet) giving the team a pep talk at the end of practice. 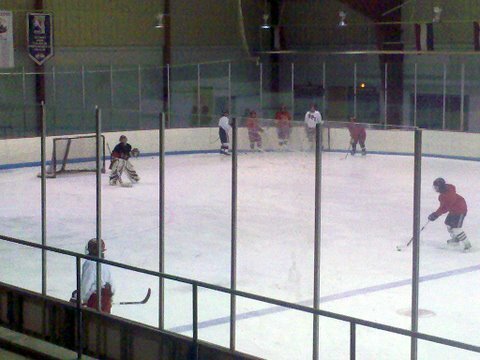 Visible on the right in the goalie pads and black sweater without a helmet is Jeremy Coupal, the Engineers' new practice goaltender. 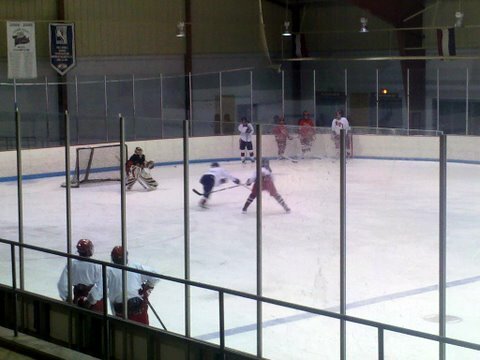 He replaces Joe Harkenrider, who left the team to focus on his studies, as the 3rd goaltender. Coupal, a junior Materials Engineering major, started eight games for the RPI club team last season, amassing a 2-6-0 record with a 4.22 GAA and .872 save percentage, with one shutout against Norwich. Before coming to RPI, Coupal was at one point was the starting goaltender at Seton Catholic High School in Plattsburgh. Former RPI practice goalie Jim Palmer, one of the most popular fan favorites in recent history, also attended Seton Catholic, as did former defenseman Glenn Coupal (who is likely related to Jeremy, but we won't know for sure until his RPI biography is released). Speaking of the club team, the Engineers will have all 14 of their home games at Houston Field House this year, starting on September 24th at 7 p.m. when they host Union. The club team will also host Brown, Merrimack, Quinnipiac, Hudson Valley CC, Roger Williams, Keene State, Westfield State, UConn, Marist, NYU, Vermont, and Norwich this season. The women are also hard at work at "The Knick." Below, the team takes a few shots on senior goaltender Sonja van der Bliek. Finally, a quick video of the women taking a few shots.